If you weren’t lucky enough to be alive in the ’80s, Hotline takes you back to a classic 80’s vibe on the stunning Miami seafront. The world of flash cars and vibrant nightlife combines itself with classic police chases to give you a feeling of adventure like the Miami-based classic video game Grand Theft Auto. The 5x3 gameboard offers 30 pay-lines UK slot and just like the majority of NetEnt creations, an abundance of thrilling bonus features. The Hotline Bonus Bet, Wilds, Expanding Wilds, Re-Spins and Free Spins Feature can produce some incredible wins. Deposit today and enjoy the culture of 80’s Miami. It doesn’t get much better than a classic 80’s vibe and police chases. Hotline takes you on a nostalgic journey through the city of Miami where risk-takers thrived on the adrenaline of business, nightlife and being chased by police. The synth wave soundtrack makes you feel like you’re starring in Miami Vice or you’re attending to a mission on Grand Theft Auto. Either way, you’re in for some fun. As you start playing the base game, you’ll notice the difference in value in the symbols. The lowest paying symbols consist of the three jewellery items. The medium paying symbols relate to typical characters from the 80’s vibe, such as: A stylish fashionista, a cop and female thief. Contributing to all your winning combinations are the sports car WILDS, which play a big part in the base game. 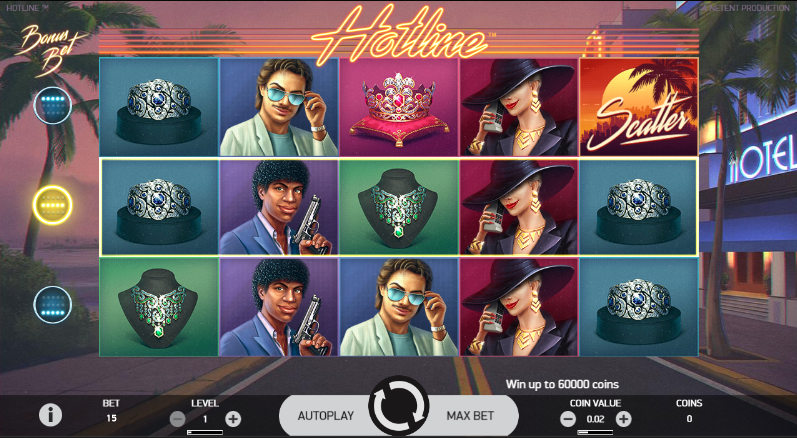 HOTLINE BONUS BET – This Bonus Bet features increase the chance to win Expanding WILDS and Re-Spins. When one Hotline is activated, the game is played with Base Bet (15 coins per level). 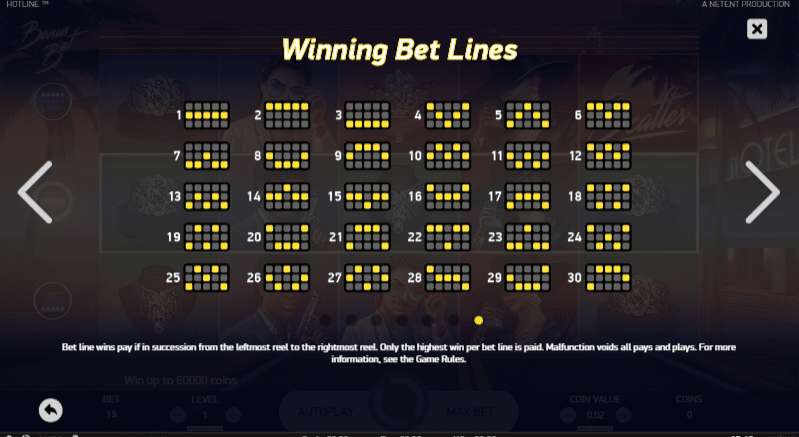 When two Hotlines are activated, the game is played with Double Base Bet (30 coins per level). When three Hotlines are activated, the game is played with Triple Base Bet (45 coins per level). WILD AND EXPANDING WILD – Sports Car WILDS can appear anywhere on the reels throughout the base game. If a WILD lands on an activated Hotline, it will expand to cover the entire reel. RE-SPINS – In cohesion with the WILD and Expanding WILD, Re-Spins occur when a WILD lands on an activated Hotline. The Expanded WILD will lock onto the reels until Re-Spins has concluded. FREE SPINS FEATURE – Hit 3 Sunset SCATTERS on reels 1, 3 and 5 to activate the Free Spins Feature. You’ll receive 7 free spins. During this feature, if a WILD lands on an activated Hotline, it will expand to cover the entire reel and will lock until the feature has concluded. Search SlotsBaby.com for more promos and game bonuses! Hotline perfectly depicts the vibe around Miami in the ’80s. Classic perms, hot weather, police chases in the evenings and flash cars cruising through the city. The beautiful animations and graphics will make your experience much more enjoyable than you’ll have anticipated. As for the gameplay, NetEnt have delivered once again. The base game is full of great bonus features, as well as engaging gameplay. If that doesn’t provide you with some substantial winnings, the Free Spins Feature certainly will. Learn the best free online slot games on Easy Slots once you've tried Hotline!